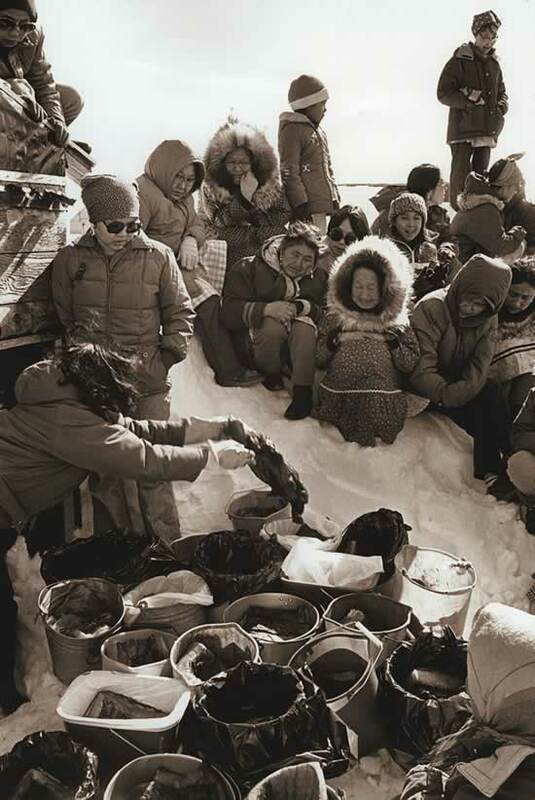 Uqiquq (seal party) in Tununak, 1980. Uqiquryaraq-wa tamana up'nerkami pissungaqata, pitaqerraaq una pilaraat, ciuqliq pitaq angelria up'nerkami. Maklagtaqameng ciuqliq tauna ellaita pikevkenaku uqiquutaq'laraat tua-i yugnun aruqutekluku tamalkuan kingulluku. Cali tua-i una angutnek irniangqerquni, ataucirqumek pivkenani, irniani una piskan, una cali uyuraa piskan, wall'u cali alla uyuraa piskan, amllerqunek ilii uqiqulartuq enem iluani tuani. Arnat kiimeng avani pitullruut pitaqerraalriit. The first catch of the season in spring, if it was a big one, was given away. When a hunter caught the first bearded seal, the family wouldn't keep it, but his wife held a seal meat and blubber give-away party, uqiquq as they called it, and gave it all to people in the community. And if a mother had several sons, not just one, if this son caught a seal, and if his younger brother caught one, or if another younger son caught one, a parent will hold give-away parties several times in spring. The lively distribution of a man's first bearded seal of the season, known as uqiquq (seal party), is celebrated to this day in many Yup'ik communities. Families spend hundreds of dollars on gifts to give along with the seal meat and blubber, in thanks for what has been given to them. 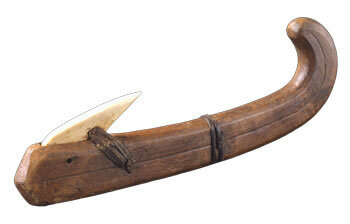 Blubber hook from Nunivak, used to carry strips of seal blubber. Taumek wani makut ikayurtalriit, takumcutalriit-llu, tuar pikam manimat'laqait, ciunrat-llu catangqerturluni. Cali-llu ikayuutekaitevkenateng arenqiallugingalriani makunek ilameggnek. That's why people who are always ready to help others and are compassionate, it seems like things are available to them all the time. And also they seem to have someone to help them when they need support from others.